I consider myself a romantic. As a long-term SF addict, my sense of wonder is sharply honed, and I love my wife with a passion that can reshape continents. But the notion of Valentine's Day, and the industry it supports, has largely passed me by. To me, love is something that you celebrate every day, in those little acts of kindness, in patience and understanding, in promises kept and pledges honoured. The notion of having one day to declare your feelings is patently ridiculous. You don't feed and water a plant once a year and expect it to grow and flourish. The industry of romance is selling a lie, one that raises false expectations and often leads to disappointment. The romantic comedy is the prime example of how we're expected to view love. The modern rom-com is a finely tuned and tautly organised piece of entertainment. The characters have been rolled from a limited set of dice, the situations designed as part of a 21-point plan that leads inexorably to the final clinch and fade-out. Even the posters look the same. The two leads lean jokily against each other around a chunky, sans-serif title, on white. It's painfully predictable, cookie-cutter stuff. I'm cheered, a little, by the appearance of Fifty Shades Of Grey as this year's Valentine's Day movie. No matter what you think of the material, at least it's something a bit different. Of course, it's celebrating an abusive relationship with a lead character that's close to being a psychopath. But then so is Wuthering Heights, and that's one of the great romantic stories of all time, apparantly. And don't get me started on Romeo and Juliet. Love-crazed kids go on rampage, six dead. For Valentine's Day this year, TLC and I settled down in front of David Wain and Michael Showalter's They Came Together, a clever deconstruction of the rom-com tropes. It takes a Zucker Brothers, Airplane-style approach to the material: it's played straight, and everything is fair game. All the tropes are there, from the kooky friends to the montage to the chase to stop the girl marrying the wrong guy. Perversely, They Came Together works as a kind of primer for romantic comedies: from character types to plot points, it digs under the skin of the genre and shows you how the whole thing ticks. In fact, the movie is almost too clever for it's own good. It's so meta that it very nearly disappears up its own primary assumption, becoming as much an exercise as the films it's supposed to parody. 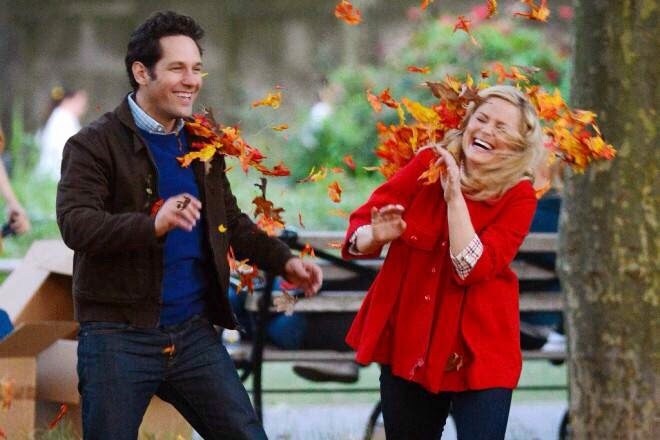 Luckily, smart casting saves the day, and both Paul Rudd and Amy Poehler bring things back from the brink. With a solid handful of Saturday Night Live cast members helping out, They Came Together is worth a look as an antidote to the usual V-Day fluff. Personally, I think the studios are missing a trick. Why should Valentine's Day just be for romantic movies? Release an action film or a horror on the nearest Friday, and you'll get everyone that hasn't bought into the myth flocking through the doors of the cinema in droves. My weekly trip to the flicks was cancelled because there was nothing new that I wanted to see. Given the choice between Mr. Grey and The Backstreet Boys, I think I'll stay at home, thanks.